Many archaeological finds, as well as folkloric and contemporary testimonies, are exhibited in Greece in about 200 public and 100 private museums and galleries. These art treasures represent a 6,000-year-old history. Many of these museums are among the world's most important. 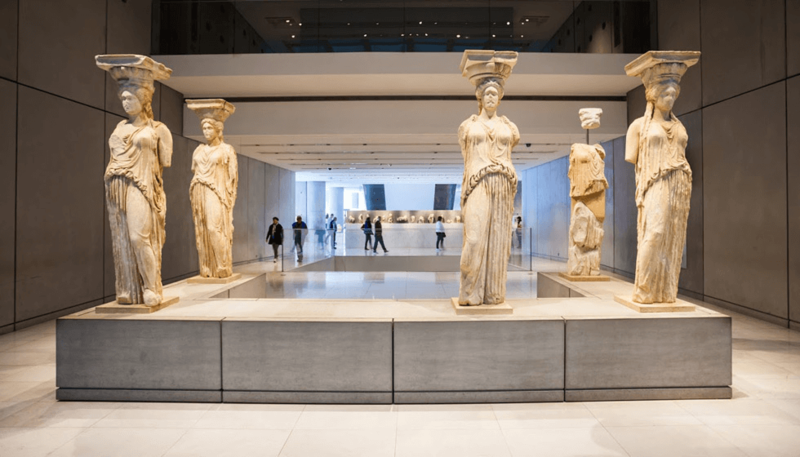 • Undoubtedly, the Acropolis Museum, established and inaugurated in 2009, is the most important Greek museum with exhibits from the Acropolis, dating from the Mycenaean era to the early Christian era. • The National Archaeological Museum of Athens houses some 11,000 ancient exhibits from all regions of Greece, as well as exhibits of Egyptian art. • The Delphi Archaeological Museum exhibits archaeological finds from ancient Delphi that include the oracle, temples and treasuries. • The Archaeological Museum of Olympia exhibits findings that depict the centuries-old historical evolution of one of the most important temples: the Temple of Zeus, which was also the cradle of the Olympic Games (from prehistoric to early Christian times). • The excavation, which began in 1861 and continues to this day, brought to light the tombs, untouched by grave robbers, under the great tumulus in Vergina. In an underground museum, the museum in Vergina, the burial mound was integrated with the alleged tomb of Philipp and other graves. • The Archaeological Museum of Heraklion contains objects from the period between the 7th millennium BC to the 4th century AD. The transition to the next era is documented by the Historical Museum of Heraklion (early Christian period to present). • The Archaeological Museum of Thessaloniki houses a collection of archaeological finds from Thessaloniki and the Macedonia region. • The adequate presentation of the archeological findings of the site in Dion is provided in the 1983 Modern Archaeological Museum. • The Archaeological Museum of Rhodes is housed in the former Hospital of the Knights of St. John, which displays works of art and antiquities of the Dodecanese islands (statues, jewels, tombstones, mosaics and stoneware) from many eras, such as from the classical and Hellenistic era or the Roman era.